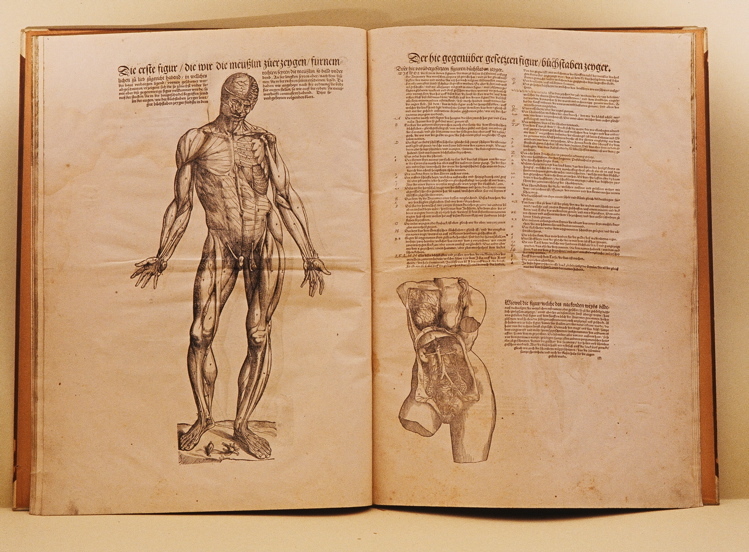 FULL TREATMENT OF VESALIUS, “VON DES MENSCHEN CORPERS ANATOMEY”, 1543. In book conservation, a full treatment is one where the book is documented, cleaned, disbound, washed and often deacidified, resized if necessary, resewn and rebound. Because it is extremely invasive (and very expensive) it is not as common as it once was, but sometimes it is necessary. It also sets a dangerous precedent– there seems to be a direct correlation between the invasiveness of a given treatment that a book is subjected to and the number of times that it is retreated. Minimally invasive treatments have become the norm, and are what I generally perform. 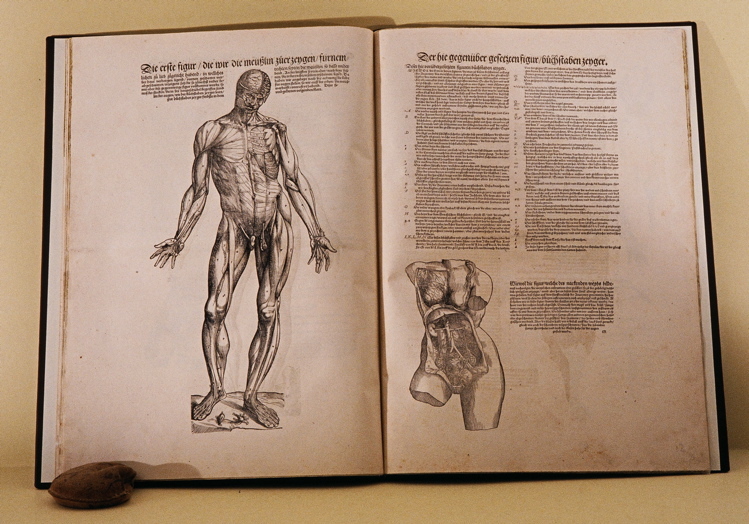 In the case of this Vesalius, however, the low surface pH of the text and overall discoloring, mechanical problems in leaf attachment, the structure of the leaves and an inappropriate, deteriorated mid 20th. C. acidic binding all lead the curator and I to decide that a full treatment was the best option. And the book smelled very bad. The leaves were documented in 35mm color slides, EPY 64 and digitally. 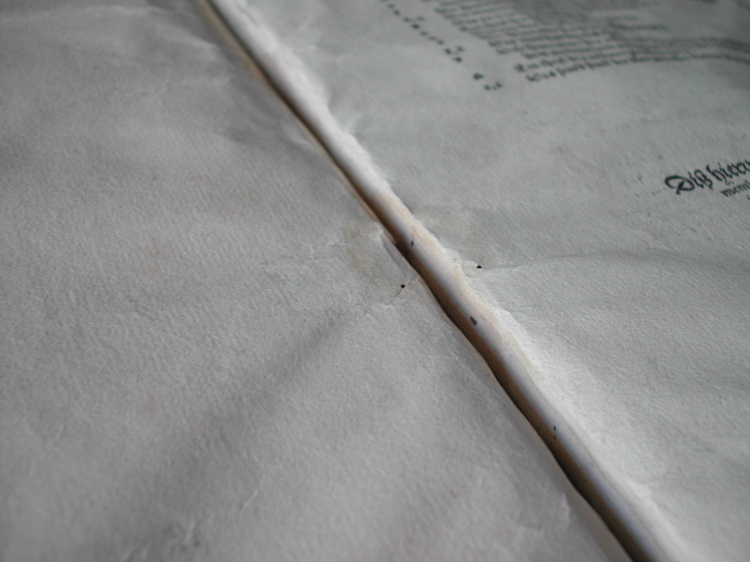 The half vellum binding with paste paper sides was removed and all the leaves surface cleaned with grated vinyl eraser. The existing leaf structure and sewing holes were recorded. General condition was poor. All 16 leaves of the text were soiled, creased and dirty. 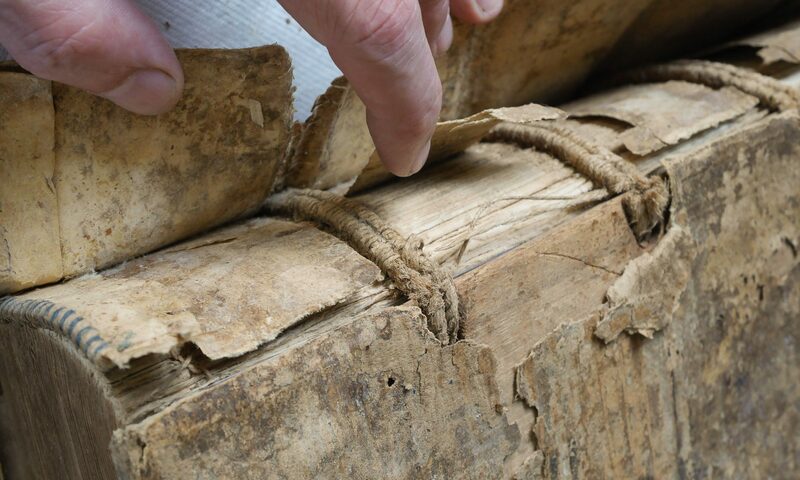 The spine folds of the pages were discolored and brittle, possibly due to acidic glue. There was a severe horizontal crease throughout the entire text. All the leaves are cross grain, which is causing additional complications as the spine edge is glued and prevented from expanding and contracting due to changes in humidity. There were a few minor tears and previous repairs with western paper that were inappropriately stiff, causing fruther distortions. The layers of paper and glue at the stubbs were starting to crack along the line caused by the stubb–this problem was exaggerated by the large size and weight of the leaves, (53 x 38 cm). Most of the leaves were joined approx. 2 cm at the spine, to make folios, so the book could be sewn in a normal manner. The stiffness of the glue and double layers of paper, combined with the crease in the middle of the page, which is acting like an “I” beam, is causing the pages to drape poorly and the page to crease in the middle, causing tears on four of the first leaves each time the leaf is turned. With careless handling, each time the page was turned, the tendency to crease was reinforced. The crease was causing the leaf to fold sharply, not drape naturally. A crease like this has been noted in other copies of this book, and rare book librarian lore attributes it to the fact that this text was used by students, and they would fold it in half to carry it to and from school. 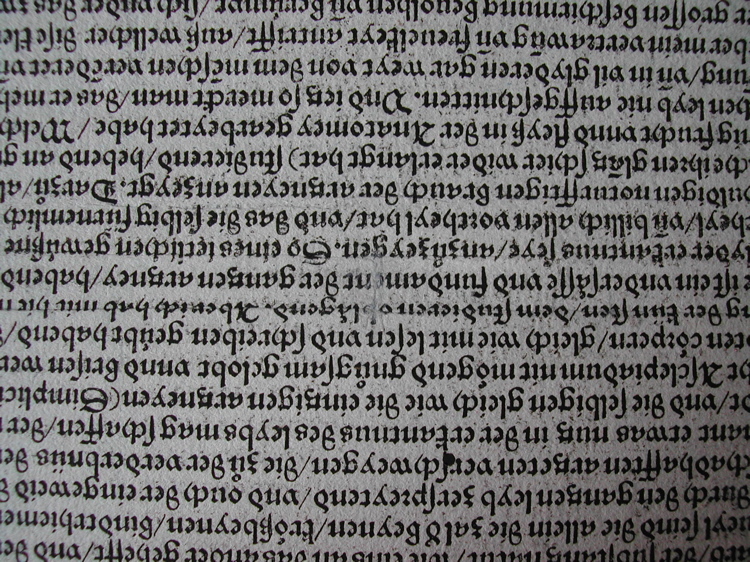 In this case, however, the crease extended through the text area, but not in the margins outside it, which would suggest it was not folding that created it, but the combination of the paper being cross grain and the extreme pressure needed to print such a large surface area. The large size of these leaves also contributed to this. On a few of the leaves the crease was so severe that a line of text was obscured. The puckered area in the middle is the result of this horizontal page fold bending. Heavy pressing during the rebinding might have compressed these folds even further, expelling air and making them impossible to open without humidification. Nine leaves contain a watermark. The flyleaves were missing. The binding and pastedown was acidic, causing stainng to the first and last leaves. Surface pH varies between 4.5-5.5. The sewing hold structure was fairly easy to record. Originally it was sewn through six single holes, likely raised cords. 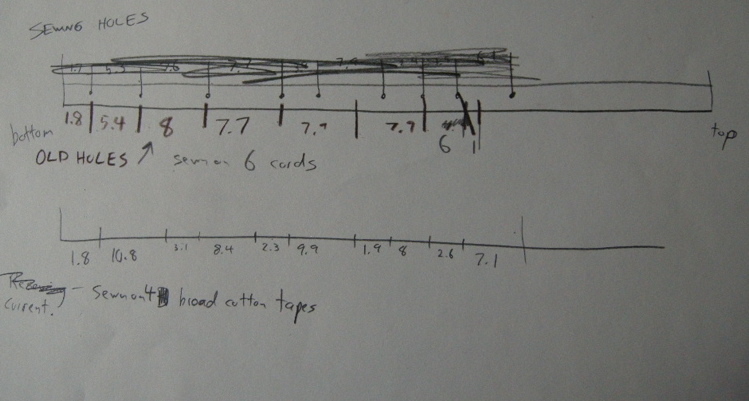 The rebinding was sewn on four broad cotton tapes. 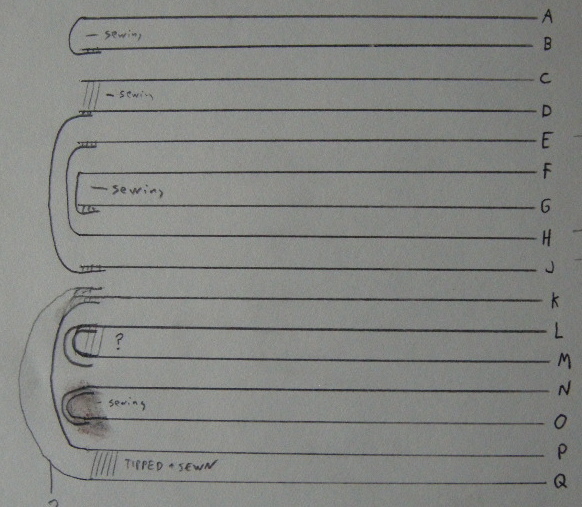 Below is a diagram of the two sewing hole patterns. It was very difficult to discern the original conjugate page structure, due to the number of detached pages, an aggressive rebinding that resulted in losses to the spinefolds, and continuing deterioration from an fairly acidic (animal?) glue that has embrittled the spinefolds. The diagram below was my best guess. The haphazard arrangement and tipped together sheets likely occurred in the mid. 20th C. rebinding. Since these pages were going to be washed, which would likely cause the leaves to separate, it was important to record the existing arrangement as accurately as possible. 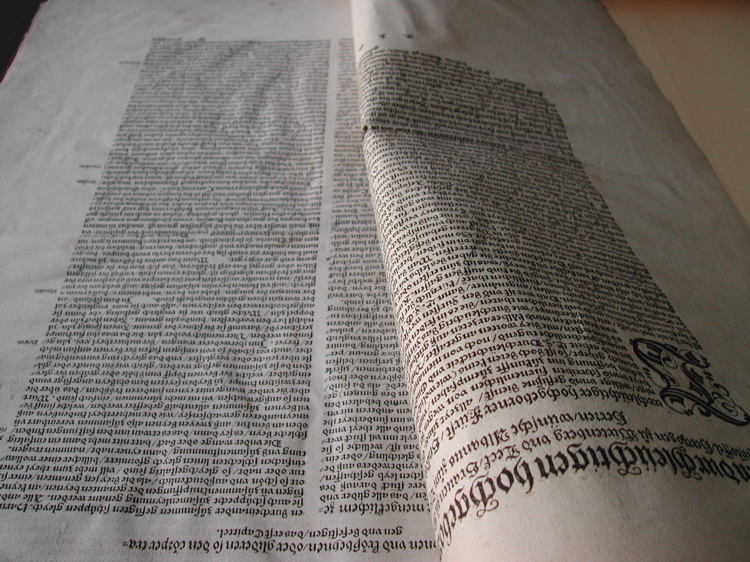 Part of the mechanical problems were caused by the way the leaves were joined- the page size was essentially one sheet of paper, and the conjugates were joined by a glued stub. The leaves were washed in distilled water 5 times until the water was clear. The appearance of leaves was greatly improved and the handling qualities were better. Specific areas of stain were further reduced on a suction table with a combination of ethyl alcohol and distilled water. The leaves were then buffered with calcium hydroxide until surface pH read 7-7.5. The paper also smelled much better after washing. At this point the leaves were dried in a two stage process- first the area around the crease was dried on a suction table, mechanically manipulating the area to spread it out so the stresses were not so concentrated around the middle of the page. The rest of the leaf was allowed to air dry naturally. Then the leaves were rewetted and dried between blotters. This was fairly successful, the crease was not eliminated completely (this very well could be impossible unless the leaves were not conjoined and rebound) . The creases were reduced enough to allow the page to drape much more naturally. 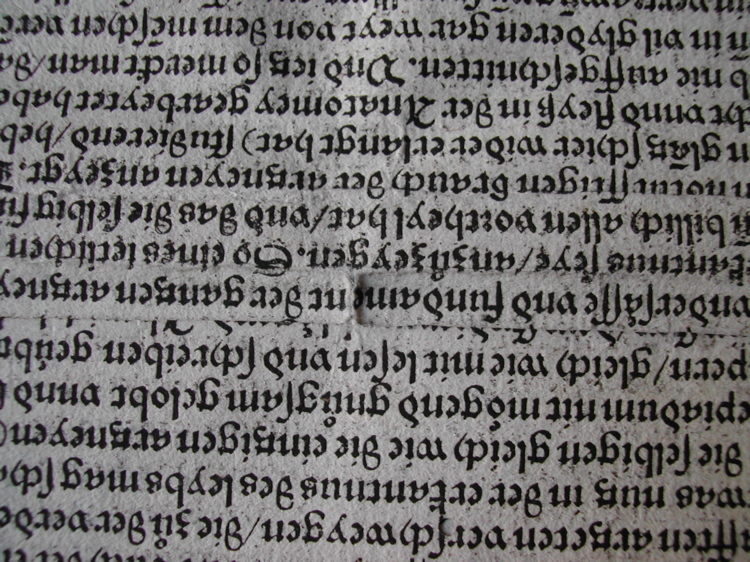 The tears were repaired with wheat starch and tissue, including the tears that were starting between the text columns. Given the size and cross grain structure, the leaves continue to respond to changes in humidity, but the overall cockling and stresses are greatly reduced and handling qualities improved. This photo shows a detail of the folded area after treatment. It was impossible to completely remove the fold, but there is an additional half line of text visible and a reader was able to decipher this, perhaps for the first time. This photo shows the a leaf draping much more naturally after the treatment was completed. 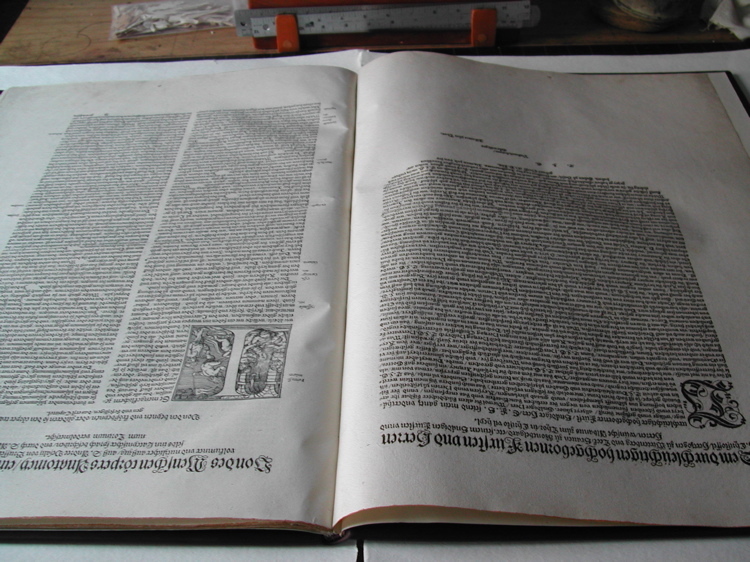 Here is a overall view of a page before and after treatment, demonstrating the improvement in overall visual appearance, reduction of the horizontal fold in the middle of the page, and reduction of distortions within the leaf. New endsheets, consisting of a double folio of handmade paper and a linen hinge were constructed and the text was resewn with linen thread on 6 linen cords following the original sewing holes. Single core headbands were sewn with acrylic dyed linen thread. Boards were made up and laced on and the book was covered in a dark brown calfskin, in a sympathetic style to the age of the text. Given the size of the book, no leather was available to match the spine of the animal with the spine of the book, the leather had to run perpendicular to the spine of the book. Even with the spine of the animal running horizontal, only two skins were large enough from the stock of calf at TALAS. Given the large size of the skin and its orientation, there was considerable expansion along the height of the volume, which had to be taken into account when paring the leather. The 53 cm of leather expanded almost 5%, or 2.5 cm. A separate pastedown of handmade paper was added and original bookplates replaced. A blind triple panel design was tooled on the front and back, and a double wall drop-spine box with three recessed gold stamped leather labels was constructed. 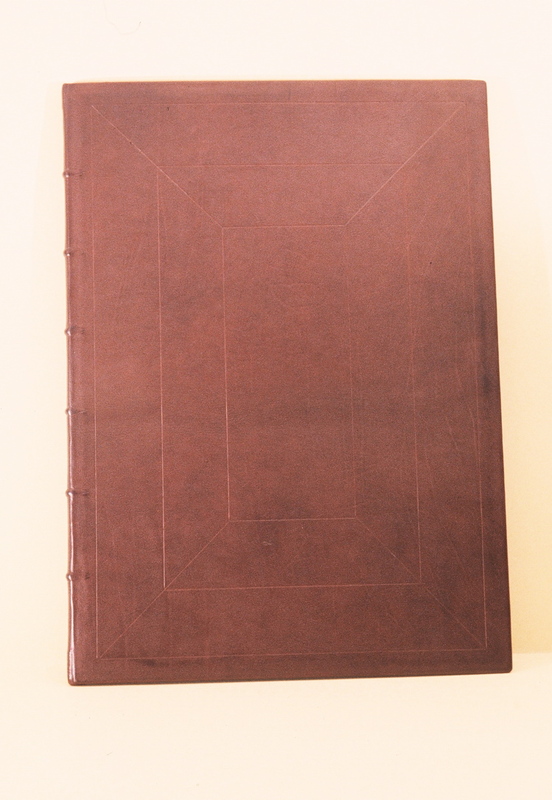 Here is a photo of the completed treatment in its new binding. Thanks to Archives & Special Collections of Columbia University Health Sciences Library for allowing me to share this information.